The line between tablets and laptops is getting very blurry very fast. After all, except for high-end portable workstations and gaming rigs, a typical laptop PC is little more than a tablet with a keyboard. 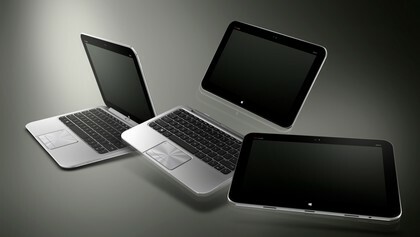 HP merges the two types beautifully with its Envy x2, creating a hybrid Windows 8 tablet/laptop that works equally well in both guises. There are two ways to conceptualize the Envy x2. One way is to think of it as a notebook where the screen comes off and can be used as a tablet. It’s better, though, to think of it as a tablet with an optional keyboard that also functions as a docking station. This docking station offers sundry connectors and a second battery. If you’re used to the traditional paradigm of a laptop PC, the keyboard base takes some getting used to. Of course, in a normal laptop, the guts are all located in the base of the computer and the screen is just that — nothing more than a display. The Envy x2 turns this paradigm on its head. The screen includes the guts of the computer, including the CPU, memory, and storage. The keyboard includes nothing essential to running the computer, though it does include a second battery. So, it’s best to think of the keyboard base as more like a docking station than anything else. There are no moving parts of any kind inside the keyboard — no DVD drive and no mechanical hard drive. Its main function, beyond providing a keyboard and touchpad, is to offer connectors for peripherals and for the power supply. The second battery provides the only real internal functionality. We were very impressed with how easy it is to connect and disconnect the tablet from the keyboard. The keyboard base has three connectors on it: two magnetic posts which guide the tablet down onto the main proprietary connector which delivers the power and data. It’s easy to securely make this connection just by feel, and once connected, it’s a very solid fit. There’s only a few second delay between connecting the keyboard and being able to use it. The transition is seamless since all the processing and memory are housed in the tablet. It’s much like connecting a USB mouse to a laptop. Disconnecting it is just as easy. You simply move the slider at the top of the keyboard to release the latch and the tablet comes free. The docking base features a full-sized "island style" (read: chiclet) keyboard which we found responsive and pleasant to use. The trackpad is wide and responsive and includes a button which lets you turn it off or on. On the left side of the keyboard you’ll find a full-sized HDMI connector for connecting to an external monitor, projector or TV, one USB 2.0 port, and a combo headphone/microphone jack. You can plug a regular pair of headphones into this jack or you can use a headset which supports this type of mini-jack to connect both a microphone and headphone. However, if you just want to plug a regular microphone into this jack, or if want to use a separate headphone and microphone, you’ll need to use a splitter. On the right of the keyboard base, there is a second USB 2.0 port and the power connector. HP uses a proprietary flat power connector which has a small light which lets you know when the system is finished charging. You’ll also find a slot for an SD card, so you can upload photos from your camera. HP’s covered the basics with these connectors, but all things being equal, we would have preferred one or two more USB ports and separate connectors for a microphone and headphones. An Ethernet connector is the main thing lacking from the keyboard base. This isn’t surprising, since the base isn’t really thick enough for the industrial designers to squeeze in an RJ-45 jack. However, since the system runs Windows 8, it would be no problem to purchase an inexpensive USB Ethernet adaptor. That, of course, is the advantage of a Windows-based hybrid computer like this; standard PC peripherals and adapters work seamlessly. However, the tablet has no USB ports; if you want to use USB peripherals, you the tablet needs to be docked into the keyboard base. 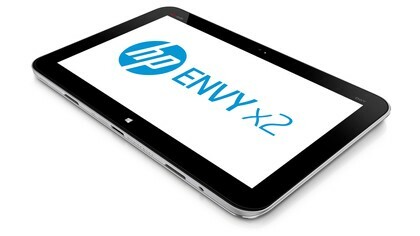 Using the Envy x2 as a tablet, the first thing you’ll notice is its size. It’s really big. It might even be a little too big. Not only is it about half an inch wider than an iPad, it’s over two inches longer. The display is 11.6 inches measured diagonally, compared to only 9.7 inches for the iPad. That’s a big difference, and for some uses, it’s a definite bonus. For others, we think it might get annoying. For instance, in reading a book, we found it a bit unwieldy when trying to hold it with one hand. The screen resolution is 1366 x 768 with a 16:9 aspect ratio. That’s pretty much ideal for watching videos, and the pixel density is comparable to the iPad 2. In this age of Retina displays, though, you might find it a bit grainy for reading books or doing other close-up work. That’s not likely to be a problem when using it in laptop mode. Overall the LED-backlit IPS Display screen is bright and clear, and looks excellent from a wide viewing angle. However, like most tablets, we found it very reflective in the sunlight; it isn’t ideal for beach time work. Besides the gargantuan proportions, it’s a pretty standard tablet design. There is a large Windows Start button at the bottom that lights up and vibrates the whole device when pressed. This button seems to be disabled when docked to the keyboard. On the back there is an on/off button and volume buttons which are completely flush against the brushed aluminum exterior. They are a bit hard to find at first, and since the buttons feel pretty similar except for their size, we think it would be pretty easy to accidentally turn it off when you are trying to change the volume and vice versa. The power supply connects to the Envy x2 through a proprietary connector that looks similar to the original flat iPod connector. It’s possible to plug the power cable directly into tablet or to recharge it via the keyboard. There’s no technical reason why HP couldn’t produce an accessory allowing you to output an HDMI signal directly from the tablet, without needing the keyboard base, but the company hasn’t yet released such an accessory. Like a typical tablet, the Envy x2 includes both front-facing and rear-facing cameras. It’s unusual for a laptop, though, to include a rear-facing camera, so we count that as a bonus, though we can imagine someone walking by the laptop being concerned that they might be spied upon. The front-facing camera is an HP TrueVision 1080p HD webcam. That’s probably higher resolution than you’re likely to be able to use with most video conferencing software, but it performed very well even in low light conditions. The rear-facing 8.0MP camera includes a flash and took good quality stills and video. Our only complaint with the cameras is the paucity of features in the native Windows camera app. HP includes the CyberLink YouCam DE that provides more functionality, but this seems like a pretty serious limitation of Windows 8 as a tablet platform. Photos and videos should be integrated into the OS, and as of now, Windows 8 falls far short of that goal. HP touts its Beats Audio so much so that the logo is emblazoned on the face of the tablet. This includes engineering tweaks, like isolating the audio amplifier and audio lines and using a non-grounded headphone jack, as well as fine-tuning the audio profile with the help of engineers at Interscope Records. Unfortunately, the hybrid nature of this computer makes its speakers one of its weaker points. We found the sound quality of the speakers good compared to other tablets; it pounds out music at a good volume, and the quality was crisp and clear if a bit tinny. However, there aren’t any speakers at all in the keyboard base, so when used as a laptop, you’re relying on tablet speakers. This puts it at a severe disadvantage to other non-hybrid laptops. The situation is a lot better if you are using headphones. The tablet itself includes a headphone jack and the keyboard has a combo keyboard/microphone jack. Audio through these with a good pair of headphones sounded exceptionally clear with a good pair of headphones. There was no noticeable distortion or background noise we could detect. There’s no question about the potential of the Envy x2. In theory at least, it’s a dream machine, able to do double-duty as both a laptop and a tablet. Imagine, after all, if your iPad could run MacOS X. That would be an incredible do-it-all machine. If the Envy x2 could run iOS, then it would be even better. The problem, in functioning as a tablet, is that it is running Windows 8. The number is growing, but right now, there just aren’t that many apps optimized to run on Windows tablets. Of course you can run practically any standard Windows application, but most Windows applications are designed to run best with keyboard and mouse. Tablet-optimized applications, which are so abundant on Android and iOS platforms, are still limited on Windows. The situation isn’t all bad. The Envy x2 comes preloaded with several popular apps like Netflix and Kindle, so you can watch movies and read books right off the bat. The Microsoft Windows store functions like its Android and iOS competitors, offering thousands of apps. However, as of this writing there are some serious limitations to app availability. For instance, no Google-created apps are available. Instagram doesn’t yet have a native app. The number of games is also very limited. Over time, as Windows tablets and phones get more widespread, this situation is likely to improve somewhat, but Android and iOS have such a head start that it’s hard to imagine Windows catching up anytime soon. Being able to run normal Windows apps makes up for a good deal of the lack of tablet-optimized apps. For instance, even though Google Earth isn’t available in the Windows store, you can download the normal Windows version and run it, either with the keyboard and mouse or just using the touch screen. Most Windows applications are usable using just the touch screen, though the user experience is going to be much better for apps designed specifically for tablet use. To offer an example, if you launch Internet Explorer from the Live Tiles, you get an interface optimized for use on tablet. The input methods available, including handwriting recognition, are presented as options at the bottom of the screen. If you go to Desktop mode and run the standard Internet Explorer, you are presented with the typical mouse-and-keyboard user interface. It’s possible to use this interface using just the touch screen, but it’s clumsy in most cases. There some key apps like Microsoft Office are available only for the Windows platform. We shouldn’t understate the utility of having a tablet on which you can edit natively edit your PowerPoint presentations or Excel Spreadsheets. If you are an aficionado of Microsoft apps like SkyDrive, Outlook, Calendar, etc. then the Windows 8 versions with Live Tiles will be ideal. There’s little doubt that going forward we can expect Microsoft to further develop the potential of Windows 8 tablets. Already the Xbox SmartGlass app lets you interact with and control your Xbox console via Envy x2 as well. Since they’ve acquired Skype, that’s also likely also to see further integration into Windows and special features for tablet like this. Mass storage is the main limitation of the Envy x2. It relies on an SSD drive in the tablet for its storage; the keyboard base has no storage at all. There are two versions, one with a 64GB drive and one with 128GB. We reviewed the 64GB version. Windows tablets are notorious for their use of memory; HP states that "up to 30GB of system disk is reserved for system recovery software." So you’re going to face a shortage of memory from the get-go. The memory shortage might not be that acute for use as a tablet, but it might become troublesome if you start installing a lot of standard Windows apps for use in laptop mode. There are a few possible solutions. Using the USB ports, you can connect an external hard drive, but of course, that data won’t be available when you undock the tablet. Fortunately, the tablet has a microSD slot. That memory isn’t going to run as fast as the built-in SSD drive, but if you can offload data files, music files, etc. onto the SSD, it will free up a lot of space for programs. You can, of course, copy the recovery partition to an external drive to free up space as well. Paying extra for the 128GB version might be wise, though, if you plan on using the Envy x2 as your primary laptop. 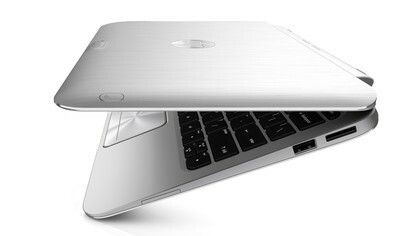 The HP Envy x2 relies on WiFi for its connectivity to the outside world. There is no cellular option and no Ethernet connector on the base either. However, since there are two USB 2.0 ports on the base, you could in theory add this functionality with the right peripherals. The tablet does offer Bluetooth and NFC (near field communications) support, so you can easily sync data with a cell phone or other tablet or use Bluetooth peripherals like headphones or a portable mouse. Intel’s Atom Z2760 processor running at 1.8 GHz powers the Envy x2. It features dual cores and 1MB of onboard L2 cache. The processor only runs at 32-bits and the system runs a 32-bit version of Windows 8.This processor is optimized for low power consumption as much as performance. One upside to this is that the machine runs very cool. It doesn’t have, and doesn’t need, any fans or vents. Another big benefit is battery life. As we’ll detail later in the review, this is where the HP Envy x2 really shines. The Atom processor only supports a maximum of 2GB of LPDDR2-800 memory with two memory channels and a maximum bandwidth of 6.4 GB/s. The innards of the tablet aren’t user accessible anyway, but even if you could open it, system memory is already maxed out for this CPU. As you’d expect, that memory does double-duty as the graphics memory for the on-chip graphics processing. The onboard graphics run at a base frequency of 533 MHz. Since the Envy x2 is a hybrid machine, its power needs to be judged under two separate criteria. 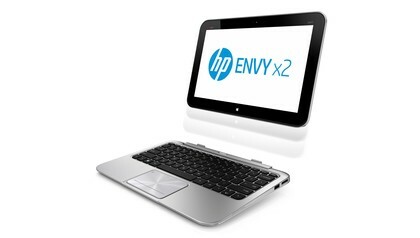 As a tablet, the Envy x2 does feel very fast running day-to-day apps like web browsing or word processing. It is extremely responsive when using these day-to-day apps; it feels as fast as an iPad or an Android tablet. It boots up very quickly as well, even from a complete shutdown. However, since the Envy x2 is running a full version of Windows 8, it has the potential to run any Windows app, no matter how resource hungry or graphics intensive. There we didn’t expect the Envy x2 to deliver much, and it didn’t. If you’re looking to do studio quality video editing or play 3D graphics-intensive games, this isn’t an ideal laptop. For that, you’ll need a much more powerful processor and more memory, along with the inevitable heat and battery drain that go along with that extra power. The system scored as you’d expect from an Atom-based system, scoring a 3625 on 3D Mark ’06 and 1715 on the Cinebench 10 multiple CPU Render Test. This simply isn’t fast enough to play current generation, or even previous generation 3D games. Battery life was exceptional, however, staying on for 7 hours and 42 minutes when connected to the keyboard base running Battery Eater. That’s the trade-off with this system. You get a very cool running tablet and laptop, with exceptionally long battery life, but you won’t get performance for any type of CPU or graphics-demanding apps. Overall the Envy x2 impressed us. 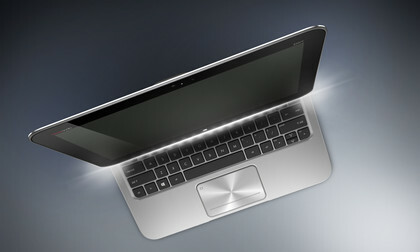 Its outstanding industrial design really shows the potential of a tablet/laptop hybrid. 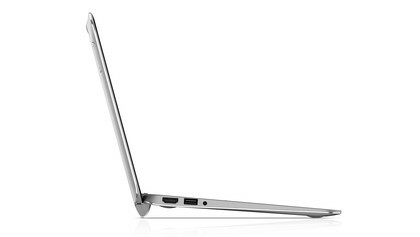 There’s little question this is the direction laptops will be heading going forward. After all, tablets are such powerful computers in their own right, there’s no reason why they shouldn’t also run full-featured desktop operating systems. It’s just a waste of computer power to limit them. That said, the Envy x2 did show some of the limitations inherent in this hybridization. The major one we see is the difference between the ideal form factor for a laptop screen and a tablet. With a laptop, the bigger the screen, the better, as long as it doesn’t increase the weight too much. A tablet, however, has to be comfortable to hold in your hands. A smaller form factor there has huge benefit. We’re not sure if HP has found the happy medium between these two needs. The biggest issue with this laptop is Windows 8. On the laptop side, it of course offers the widest range of apps and features. When used as a tablet, however, it’s no match for iOS and Android in terms of app availability and overall optimization for the tablet user interface. This is sure to improve over time, but as of now, the limitations are real and undeniable. In the end, though, we see so much potential in the Envy x2 we’re willing to overlook some of its awkwardness. It’s the type of device that is sure to improve over time, and it’s showing the way to the undeniable future of ultralight laptops.